Carpal tunnel syndrome (CTS) is a compressive focal mononeuropathy that is brought on by compression of the median nerve as it travels through the carpal tunnel. Patients commonly experience pain, paresthesias, and weakness in the median nerve distribution. Carpal tunnel steroid injection at the wrist is used to treat the symptoms of carpal tunnel syndrome by injecting a steroid solution into the ulnar bursa surrounding the median nerve. For mild to moderate carpal tunnel syndrome, carpal tunnel steroid injection can be used in conjunction with other conservative measures such as splinting, physical therapy, ergonomic modifications, rest, and regular exercise. Conservative modalities, including median nerve steroid injections, should generally be attempted prior to pursuing surgical options.Historically, carpal tunnel steroid injections were typically used for only mild median nerve entrapment (as documented by electroneurography) as well as for temporary pain relief in anticipation of definitive flexor retinaculum surgical release. In general, injected corticosteroids appear effective in reducing subjective symptoms for 1-3 months when compared to placebo. While short-term relief of symptoms after injection appears superior to relief after carpal tunnel release surgery, the advantage is lost over the course of a year. Electrodiagnostic studies such as nerve conduction studies and electromyography are typically obtained to determine the severity of nerve damage prior to performing the procedure. Steroid injections should be avoided prior to planned electrodiagnostic testing, as the presence of steroids may alter test results. Several clinical tests can be used to diagnose carpal tunnel syndrome. One is Tinel's sign, which is done by over the median nerve at the volar crease at the wrist to reproduce the paresthesia. The Phalen test involves holding the flexed wrists against each other for several minutes to provoke the symptoms in the median nerve distribution. Manual carpal compression testing is done by applying pressure over the transverse carpal ligament and evaluating for paresthesia within 30 seconds of applying pressure. The wrist is a complex joint that bridges the hand to the forearm. It is actually a collection of multiple bones and joints. The bones comprising the wrist include the distal ends of the radius and ulna, 8 carpal bones, and the proximal portions of the 5 metacarpal bones. The carpal tunnel of the wrist is defined anatomically by the transverse carpal ligament on the volar surface and the carpal bones on the dorsal surface. The transverse carpal ligament, also known as the flexor retinaculum, attaches radially to the trapezium and scaphoid tuberosity and ulnarly to the hamate and pisiform. The contents of the carpal tunnel include the 4 flexor digitorum profundus tendons, the 4 flexor digitorum superficialis tendons, the flexor pollicis longus tendon, and the median nerve. See images below. There are 2 bursae in the wrist. The radial bursa contains the flexor pollicis longus tendon. The ulnar bursa, also known as the common flexor sheath, holds the flexor digitorum superficialis and profundus tendons. When the hand is supinated, the 4 superficialis tendons lay on top of the 4 profundus tendons, forming a U-shaped structure referred to as the ulnar bursa. On top of the ulnar bursa, and below the transverse carpal ligament, lies the median nerve. 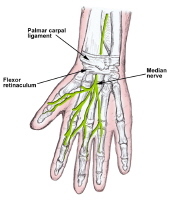 Although the median nerve itself has 2 sensory branches and 1 motor branch, only 1 sensory branch and the motor branch traverse through the carpal tunnel and are affected by carpal tunnel syndrome. This sensory branch is responsible for sensory innervation of the thumb, index finger, middle finger, and radial half of the ring finger.